If you're thinking of updating the look of your home, start right at the top with your ceilings with your popcorn ceilings. 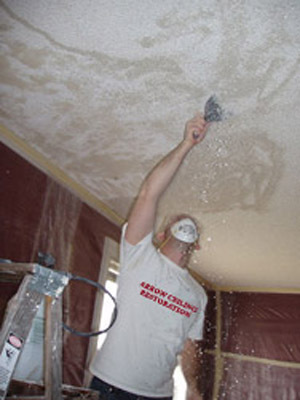 Established in 1987, Arrow Ceiling Restoration provides popcorn ceiling removal of outdated popcorn ceilings, including homes, apartment complexes, condos, office buildings, and more throughout Tampa! In about two days your Tampa home can be improved with a skip trowel ceiling texture - resulting in a ceiling that is ready to paint for a new modern look. Also consider Popcorn Ceiling Repair if you are limited with funds, which gives you a temporary solution. How much does it cost? -- Give us a call or send an email and we'll give you a fast and simple estimate. All we need to know from you is the year your home was built and the approximate square footage of the home. Remember, any home or condo built prior to 1978 needs asbestos testing. Please contact us for additional information. Preparation -- So that our experts performing texture ceilings and walls services may perform and render the highest quality of service, we ask that our customers remove breakables, valuable items, clutter, and/or draperies (any item that touches the ceiling) prior to our arrival. We will take care of the final coverup during job preparation. Eliminating the Mess -- Our service is performed in the quickest, cleanest and most efficient manner. With more than 20 years of experience, our skilled professionals and The Scalper team-up to remove the acoustic and fix any ceiling imperfections. Check out our Popcorn Ceiling Removal Procedures page to see the process in action! Finish -- Tampa Texture Ceilings and Walls Process starts with the skilled professionals applying a custom hand, semi-smooth skip trowel finish in one to two working days. Our service improves any home with a new modern look. If you're looking for a Tampa Florida Ceiling Contractor Specializing in Popcorn Ceiling Removal, Popcorn Ceiling Repair, Drywall Repair, and Texture Ceilings and Walls, contact Arrow Ceiling Restoration today at (813) 840-3717, or complete our estimate request form.